Contents: Preface; Introduction, Tom Inns; Ideal states - Engaging patients in healthcare pathways through design methodologies, Alastair S Macdonald; The healing environment, Jacques Mizan; Designing healthy and inclusive public outdoor spaces for young people, Lamine Mahdoubi; The view of the child - Explorations of the visual culture of the made environment, Catherine Burke, Claire Gallagher, Jon Prosser and Judy Torrington; Orientating the future - Design strategies for non-place, Richard Coyne and James Stewart; Screens and the social landscape - Digital design, representation, communication and interaction, Carey Jewitt, Teal Triggs and Gunther Kress; Technology and social action, Steve Walker and Andy Dearden; Win-win-win-win - Synergy tools for metadesigners, John Wood; Embracing complexity in design, Jeffrey Johnson, et al; Emergent objects - Design and performance research cluster, Alice Bayliss and Joslin McKinney; Designing physical artefacts from computational simulations and building computational simulations of physical systems, Mark d'Inverno and Jane Prophet; Understanding and supporting group creativity within design, Hilary Johnson, Peter Johnson and Tim Coughlan; Nature inspired creative design - Bringing together ideas from nature, computer science, engineering, art and design, Thorsten Schnier, Russell Beale, Xin Yao, Bob Hendley and Will Byrne; Spatial imagination in design, Jane Rendell and Peg Rawes; Spatiality in design, John Stell, Lynne Cameron and Kenneth G Hay; Discovery in design -People-centred computational issues, Ian Parmee, Lisa Hall, John Miles, Jan Noyes, Christopher Simons and David Smith; Design imaging, Gordon M Mair and Kevin Miller; Sensory design and its implications for food design and presentation, Brent Richards; The emotional wardrobe, Sharon Baurley and Lisa Stead; Interrogating fashion - Practice process and presention - New paradigms for fashion design in the 21st century, Sandy Black; Design performance, Jillian MacBryde and James Moultrie; Index. 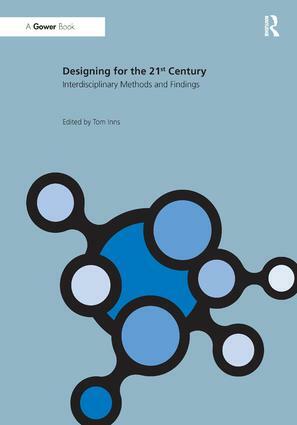 Professor Tom Inns is Director of the AHRC/EPSRC Designing for the 21st Century Research Initiative. He is Chair of Design at Duncan of Jordanstone College of Art & Design, University of Dundee. He was formerly Director of the Design Research Centre, Brunel University, UK.